The purpose of this article is to explain why Glacier Point has the several qualities necessary to make it a suitable place for the use of astronomical telescopes for public programs. These qualities include: lack of cloudiness, warm evening temperatures, negligible wind, little horizon obstruction, accessibility to park visitors, good transparency (dark sky), and little atmospheric turbulence. Aside from the occasional frontal storm which produces cloud cover over the entire Park, the most common cloud form in Yosemite is Cumulus Congestis, produced by the prevailing westerly winds which push air over the Sierra Nevada. These clouds are intensified by convectional cells caused by solar heating of the Sierran batholith. The cumulus build-up is usually restricted to the high country and normally subsides at the end of day as the solar heating diminishes. Glacier Point is located well to the west (about 12 miles) of the Sierran crest with no high peaks in the immediate vicinity. Astronomy programs have only been clouded out nine nights in almost 200 scheduled over the last four summers. Six of these nights were during major frontal storms and only two when cumulus towers moved westward from the high country in the evening. Evening temperatures at Glacier Point are mild in the summer, with some nights requiring only a light jacket for comfort. Wind at the Point is almost negligible as the prevailing westerlies are blocked by Sentinel Dome (about 1,000' above and to the west of the Point). Other air movement is greatly reduced by a friction layer of tall stands of fir and Jeffrey Pine near the observing site. At night, throughout the Park, air next to the ground is cooled rapidly by radiatively cooling rock which is exposed to the sky. The cooled air is more dense than air around it which starts a cool air drainage wind. This wind intensifies when the air is concentrated into stream valleys and, like water, gathers momentum as it is funneled downslope. This “mountain breeze” is not a problem at Glacier Point, as the air is well distributed by the many paths available to it via the Illilouette drainage and the south rim of Yosemite Valley. Any air draining to Glacier Point is further dissipated by the forest which is upslope of the observing site. Tests with telescopes in 1974 have shown the Sentinel Dome area to be too windy, due to prevailing westerlies, and the Bridalveil Creek drainage too cold, due to drainage winds, to be used as observing sites. At the Glacier Point Hotel scar the horizon obstruction is limited to 20� to the north and west. There is no obstruction to the east where objects rise as the earth rotates. In practice, objects near the horizon are poor telescopic subjects due to rising air currents which distort the image. Glacier Point is quite accessible from the Valley and Wawona and has sufficient parking for visitors. The daily sunset program is an inspiring prelude to the evening’s observations currently held three nights a week. Of primary importance to the use of the telescope are transparency and atmospheric turbulence. Transparency refers to the darkness of the sky at the observation site. Good transparency does not derive solely from high elevation, but from lack of atmospheric contaminants. Dust and smoke in the air, especially in the presence of light scattered by them, spoil viewing of faint objects such as star clusters, galaxies, and nebulae. Any place where particle pollution can be trapped (cool air above warm, making an inversion) leads to reduced transparency. Glacier Point is far above and away from dust and smoke and the drainage of cool air toward the Valley at night keeps the air at the Point dust free. Atmospheric turbulence makes stars “twinkle” and the magnified image of the telescope move and undulate, rather as the image of a fish appears to move when one disturbs the water in a pond. The quieter the water, the easier it is to see the fish; the more still the air the easier it is to view the moon, planets and stars. Rising air columns above the Sierra backcountry make the air very turbulent in the daytime, but the rapid cooling of the rock at night, the lack of nearby campfires, and no large, unforested rock exposures near the Point make the air settle near the horizon within an hour or two after sunset. The eastward exposure of the Glacier Point observing site provides maximum heating in the morning and less in the mid to late afternoon, allowing the local observing area to be cool even before sunset, thus giving good high angle seeing as soon as stars appear. 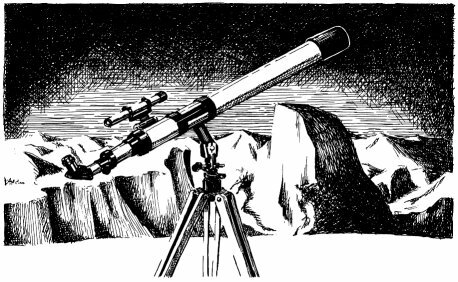 In the sixteen years that I have been involved with astronomy I have not found a more consistently excellent observing site for summer telescopic observation. In the past four summers at Glacier Point there have been nearly 200 “star parties” for the park visitors, and over 10,000 people have seen the wonders of the universe at one of the finest observing sites in the West.